What will be the world's largest unmanned helicopter was unveiled at Airshow China on Nov 7 along with notice that R&D will be conducted at a branch to be built in Zhuhai. Beijing ZHZ Technology's Zhuhai plant, which is yet to be sited, will deal with industrial-grade military-civilian integration technology. The operation will rely on cooperation with Beijing Institute of Technology School of Aviation in Tangjiawan and other Zhuhai colleges. 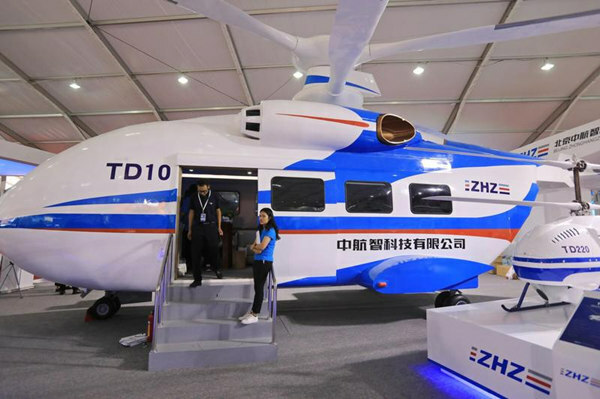 Although the 15-ton aircraft is still being researched, its life-size mockup is set up as a display booth to attract the interest of 130,000 businesspeople and 240,000 other visitors. Using bearingless rotors, the TD10 helicopter is designed to carry five tons of cargo in stable condition and be easy to maintain. It would be used in complex environments such as island reefs, plateaus, and mountains. Modular design represents the future development of the vehicle, according to Zu Yajun, deputy manager of Beijing ZHZ Technology. The drone has evolved from the company's T333 unmanned helicopter, still the country's largest such vehicle, and will fill a market niche. Beijing ZHZ Technology is a national High & New-Technology Enterprise with headquarters in the capital city's tech hub, Zhongguancun, which is also called China's Silicon Valley. The Zhuhai branch will operate the unmanned helicopter R&D center, which will also train students from the School of Aviation of the Beijing Institute of Technology Zhuhai Campus and other colleges.